This is the final blog post in our series about loans and debt. It’s another loan. It’s like 4 billion American dollars, right? How can we repay this? Uh, there are too many loans! These were offhand comments made by friends in casual conversations, yet I think they reveal something significant that is forming in the minds of many Mongolians around the rising indebtedness of their country. In 2011 and 2012, when I conducted research on the growth of the mining industry, I heard little public discussion about debt and loans in relation to the mining industry and the national economy more broadly. Of course, mining companies at the time were engaged in a wide range of official and unofficial lending practices to finance operations, and there were important discussions between companies (both foreign and domestic) and the government about who should bear the responsibility of financing mining projects and ancillary infrastructures. However, in interviews with a number of diverse Mongolians living in different regions of the country, I found that people were more interested in the then hot-topic of national equity ownership in mining projects like Oyu Tolgoi than about the loans required to make such projects possible. When I returned to Mongolia in the fall, I observed how discussion about national-level debts filled evening news programs, came up in crowded jeep rides across the countryside, and figured into intimate conversations among family and friends. Far from being an abstract issue for government and economic policy, ‘foreign debt’ (gadaad ör) and ‘national/state debt’ (ulsyn/töriin ör) appears to be becoming internalized in people’s lives as a new economic reality and a subject of collective concern. Rising public awareness of national-level debts reveals how Mongolia’s relationship with debt has changed in recent years. In 2012, the Mongolian government acquired its first sovereign bond, nicknamed the ‘Chinggis Bond’. Sold as a five- and ten-year bond, it garnered US$1.5 billion, far more than was initially anticipated. A year later, the Development Bank of Mongolia issued a ¥30 billion 10-year ‘Samurai Bond’ in Japan. The word ‘bond’ has since become normalized in colloquial Mongolian, referring specifically to a loan financed by investors on international markets. More generally, and perhaps significantly, bond is also used to refer to debt that Mongolia, as a nation, owes to foreigners. The debts raised by the two sovereign bonds are small in comparison to the national debts of other nations – a point Mongolian politicians and economists commonly make. Their significance, though, is compounded by other external debts acquired by the government and companies, especially miners. The timing of this debt accumulation is significant, as it has occurred not in a period of growth but amid the slowdown of the Chinese economy and the global commodity cycle, two interrelated dynamics to which Mongolia is exceptionally exposed. According to a report published in November by Fitch, Mongolia now has the second highest external debt to GDP ratio in the world at 129.8%, representing some $22 billion. This amount of debt could feel distant to an individual, like how, as an American, the US national debt of $16.3 trillion feels to me. However, I think that many Mongolians can relate to this debt because it reflects the indebtedness they feel in their own life, albeit on a much larger scale. When Ganzorig expressed to me that there are “too many loans,” he was directly commenting on the large amount of foreign debt his country was accumulating. Knowing Ganzorig well, I could also hear the words reflecting his frustration with living a life where he is constantly swapping one loan for the next, slowly building more and more debts in the process. Ganzorig struggles to operate a small electrical business in Ulaanbaatar, often relying on small loans, barter, and gifts from friends to get projects done. He could not get a business loan from a bank because he had no office property to serve as collateral. He could not acquire an office because he is already plagued with stress and sleepless nights about how to pay a hefty monthly mortgage on an apartment he bought a couple years ago through the 8% mortgage scheme. Additionally, following the government’s adoption of a new tax law last August to get tax revenues from businesses, Ganzorig has been under pressure to pay taxes he did not know he owed to a local municipality. Moreover, for someone like Ganzorig whose everyday life is already shaped by chains of debt, national debt might feel like yet another link that weighs the chain down. Yet it is a link that is not necessarily of one’s choosing, given that debt like the Chinggis Bond is classified as ‘public property‘ (ard tümnii ömch) to be repaid through taxes and the state budget. Rumors and conspiracy theories abound about how the allocation of bond monies was based on political and business alliances and secret deals instead of transparent and egalitarian tender processes. Indeed, when the majority of politicians are also involved in private businesses – a phenomenon Bum-Ochir Dulam explored in his post on the mortgage market – any government-backed economic project appears suspicious. ‘Big Money Carries Big Risk’ (Ersdel Dallah Ih Möngö). 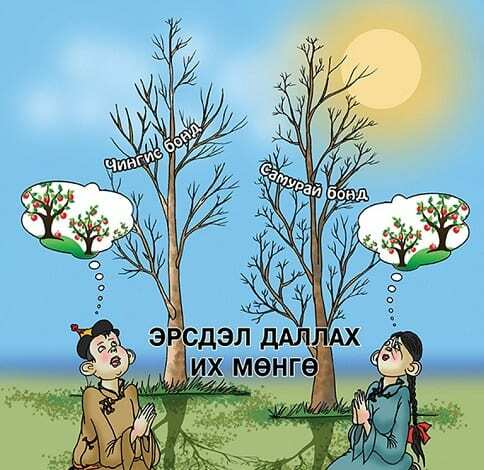 The barren trees represent the Chinggis (left) and Samurai (right) bonds. Source: www.mongolianeconomy.mn. In Ulaanbaatar, my friends point out features of the urban landscape that they associate with the bonds: smiling faces painted on sewer covers, empty apartment buildings, new roads and bridges, and pedestrian cross walks. In rural western Mongolia, people also pointed out similar new features in their district center that they thought were built with government-backed ‘projects’ (tösöl) funded by the Chinggis bond. While these improvements seemed welcomed, people wondered about where the rest of the bond monies have disappeared and why long-term things that would make Mongolia more productive in the future (heregtei yum) – like better hospitals and schools, and more domestic industry and jobs – have not been developed. A smiling face on a sewer cover does little to help someone pay their own debts, let alone the nation’s. The message about GDP growth and the clever alliteration of words at the bottom, which can be translated as #crisis #sale #China, reflects the kind of grim expectations Mongolians have for 2016. The IMF/World Bank warns that Mongolia is at risk of ‘debt distress’ because of its mounting external debts, declining foreign investment and revenues from mining, and looming debt repayments. In 2017, $500 million from the Chinggis bond and a $580 million government-guaranteed bond through the Development Bank of Mongolia are owed to creditors. US$2.4 billion from a three-year currency swap with the People’s Bank of China is also due, though this is anticipated to be extended into the future. Given the widely discussed lack of liquidity in Mongolia, how these debt are to be repaid is contested and uncertain (see here and here). Since Ch. Saihanbileg became Prime Minister in November 2014, the government has declared that there is now an ‘economic crisis’ (ediin zasgiin hyamral) in Mongolia that must be managed. ‘Debt distress’ is part of the crisis, but there are also wider economic challenges that Mongolians are feeling in very tangible ways. The value of the Mongolian tögrög is regularly hitting new historic lows, herders are selling animal meat and skins at the worst prices in memory, salaries have been cut or suspended across a number of sectors, and people have lost jobs amid the retreat of foreign investors. If you get into a taxi cab in Ulaanbaatar and ask the driver about the economy – he or she will very likely describe it to you as hyamral, a crisis. It seems, too, that the language of crisis has as much to do with future expectations as about the current condition. Khongorzul may be suggesting this by flagging the words “discount” and “China”, given that there is widespread anticipation – and outright fear – that the Mongolian government will address its debt distress by giving away its mineral wealth to China for little or nothing in return for financial assistance. These dynamics paint quite a negative picture for 2016. Mongolian astrologers are calling this new lunar year of the fire monkey ‘evil faced’ (muu nüürt or nüür muut) because it is expected to bring low precipitation and poor forage for livestock, and an increase in political struggles and poverty, among other things. The upcoming parliamentary election this summer also adds weight to the year, as election seasons are often times when much happens and is promised. It will be important to watch how Mongolian politicians address the issue of debt this year. There are some individuals who seek to make the looming debt repayments seem less severe and manageable, whereas others seek to increase public awareness about their size and significance. Either way, it is a highly politicized field. We [Mongolians] are all socially bonded by the Chinggis Bond. I have debt, our nation has debt, we all have debt. It is not only that so many Mongolians carry personal debts, but that individuals feel that they share in the responsibility of repaying national debts. This responsibility may take the form of austerity measures, like increased taxation, budget cuts, and job losses. Or it may be more direct, such as the government calculating the amount of national debt to be allocated to every Mongolian, even newborn children – a scheme that is reputedly underway. Mongolians are also concerned that they will be implicated in governmental actions that they personally oppose and which might affect the fortune and future of their nation. For instance, subsoil wealth, like the gold deposits near Noyon Uul, may be extracted not for development purposes, but to pay off debts to foreigners. A Space for New Citizen Politics? Our blog series has documented the pervasiveness of loans and debt in Mongolia. While lending practices and debts are not necessarily seen as negative, and can even help build new forms of sociality and economic possibility, the cumulative impact of personal, business, and national debts is uncertain. As seen in other places where rising national and personal debts have become touchstone issues, debt can be a galvanizing societal force that can lead to popular uprisings, movements, and regime changes. In Mongolia, where the government has never had to be dependent on nor be accountable to citizens through public taxation, given its access to other revenue streams, the shared experience of being ‘collective owners’ of national debt may open the space for new forms of citizen politics. Mongolians may question their entanglement in their nation’s debts – which they never asked for in the first place – and why they and perhaps future generations should bear the debt burden. Conversations about debt with my research partners, Sh. Tuya and G. Munkherdene, contributed to this post. Domestic and foreign companies commonly viewed the government as seeking to bear as little debt as possible. 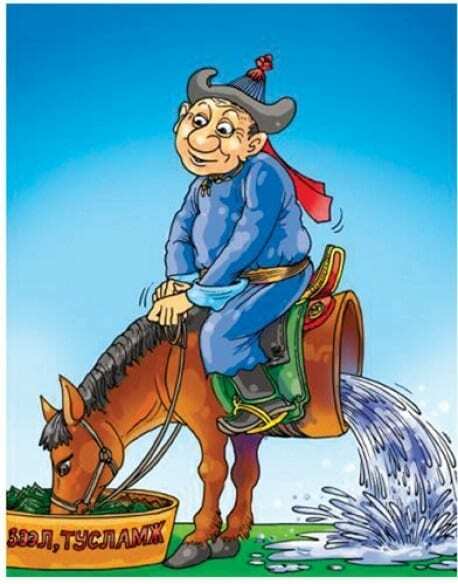 ‘Foreign debt’ and ‘national/state debt’ are sometimes used interchangeably in Mongolia. Foreign debt can include both public and private debts obtained abroad. National/state debt refers to monies which the government has borrowed (which, in the case of Mongolia, is primarily sourced abroad). When the government borrows money externally through a bond, the debt is known as sovereign debt. For simplicity and to reflect how Mongolians themselves commonly talk about national-level debts, I use ‘national debt’ in this blog post. It is difficult to find consistent figures of Mongolia’s total external debt. Different entities in Mongolia like the Ministry of Finance, researchers, politicians, and the IMF/World Bank classify national debt using different metrics. For instance, some calculate currency swaps as part of state debt, whereas others do not. Mongolia revised its Debt Management Plan in 2015 in an attempt to clarify the issue. Someone who “keeps money in their pocket” is often seen in a negative light as ‘stingy’ (haramch). Someone who redistributes personal monies through loans or gifts to friends and relatives is a characteristic of a ‘good person’ (sain hün). Data on the amount of this currency swap varies. In a parliamentary meeting, the value was put at $1.9 billion.